This past weekend I was in a shop called Ten Thousand Villages in Northampton, MA which sells fair trade handcrafts from around the world. I was charmed by a star ornament which is the inspiration for the peace stars in this month's project. The links lead to a sampling of stars in art and craft. I used half of a back panel of a brown grocery bag for my accordion pages, a cereal box for the cover, and yarn for a tie. Each page has a peace star on it. You can print the peace stars in this pdf or make your own. Another idea is to put a peace star on the cover and inside write 4 things you can do to make a more peaceful world, one per page. For a longer book, you can follow the directions for attaching sections in the directions for the Index Card Accordion. A sculpture in Oslo, Norway by Vebjorn Sand has been given the name the Peace Star. The structure draws its inspiration from a star-form first conceived by German astronomer, Johannes Kepler (1571-1630.) It consists of twenty three-sided pyramids radiating from the core. The Star itself is 14-meters high and 14-meters wide. The giant structure was covered in specially fractured glass to create a dazzling illuminated sculpture visible from the air and floating above the fir trees of the countryside. Sculptor Chris Drury created this domed stone chamber at Vanderbilt University. An aperture on the top functions as a camera obscura so that the sky and horizons are reflected on the walls of the chamber. These directions are by Diane Weintraub and are one of a series from the San Diego Museum of Art. are illuminated Advent or Christmas decorations popular in Germany and in places in America and Europe where there are Moravian congregations. The first ones were made in the 1830's at the Moravian School in Niesky, Germany as a geometry lesson or project. 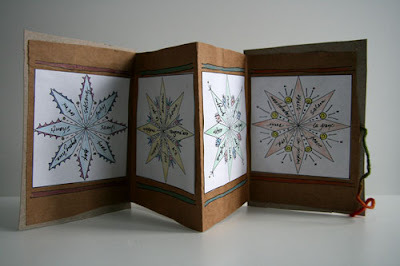 The geometry is beyond me as were the directions for these supposedly simpler paper stars. My mother was taught how to make them by a German neighbor when I was young but I never learned. I am not defeated but have not had the time to complete the directions on this website. You may want to try. They are lovely. There are directions for using the computer and for drawing with a ruler and freehand. The freehand version is the same as the star that Eric Carle says his grandmother drew for him in Draw Me A Star. Thank you so much. I enjoyed everything. It is funny that I read this tonight because this morning I helped my children and some other children to make star ornaments! The pdf file you included will not open but the link to make an 8-pointed star is a good start!